PE EGI High Grade is aproximately 20% thinner for the same breaking strain as traditional PE lines. Featuring a special smooth surface manufacturing process which reduces friction and increases casting distance and helps with abrasion resistance. PE EGI HG uses an advanced colour marking system with a change of colour every 15m and black markings every few meters. 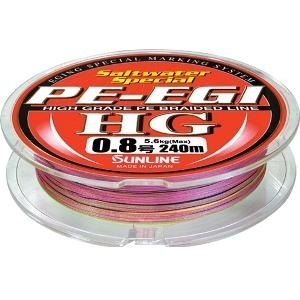 This colour marking system gives you an instant visual when casting or fishing plastics, blades or squid jigs down deep so you know how much line you have out.